Spring fishing in Chicago is almost here and we are itching to get the boat in the water in the next couple weeks. 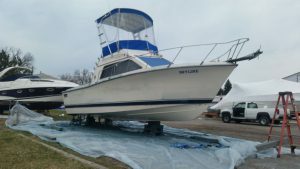 We’re currently getting the boat fixed up with a fresh coat of bottom paint, new LED underwater lights, and some new sonar tech! With no major upgrades or repairs pending, we’ll be in the harbor before April 1st. We’re anxious to get some test fishing in before our first few charters. Due to the mild winter, we are getting reports that the Coho are showing up already, so we’re expecting a great start to the fishing season. It’s not uncommon for charters in April to quickly limit out! We’ll go through a school of Coho in shallow water and have 3-4 rods go off at once, which makes for an exciting trip where everyone is on their toes. If you’ve only fished Chicago during the summer, we highly recommend trying the spring salmon fishing experience! Booking is open for the 2017 season. Call or book online.